The Global Lift Corp's Superior Series S-350 powered lift is fully ADA Compliant and is under $3000 with an anchor. It is the only lift available at this price and it still offers all of the great safety and security features that you would expect from a more expensive lift. 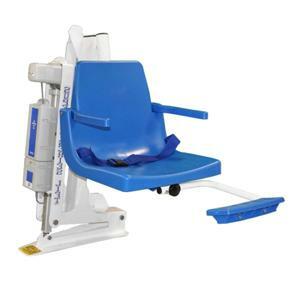 It has an easy to install concrete anchor system, flip-up arm rests, footrest, lap belt and battery operated system. The Superior Series lift is an economical option for making your pool or inground spa ADA Compliant. It can be used on most pools and inground spas and it is intended for right side use only (while seated the pool or spa must be on the user's right side). The Superior Series S-350 also features an Anti-Pinch Linkage System that holds the seat in a level position with an external linkage system that virtually eliminates pinch points. This lift is very easy to operate and is great for home or commercial use. *Your order will not be processed without the completion and submission of the Dimensions Worksheet. After your order, we will fax you the dimension worksheet and would need it faxed back to us within 24 hours to ship next day.